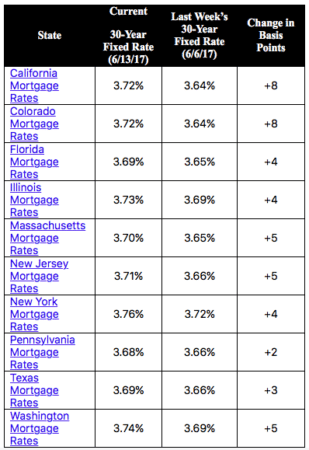 According to Zillow Mortgage Rate Ticker, 30-year fixed mortgage rates have risen for first time in five weeks to 3.71 percent. The rate for a 15-year fixed home loan is currently 2.97 percent, while the rate for a 5-1 adjustable-rate mortgage (ARM) is 2.95 percent. A total of 81,495 U.S. properties with foreclosure filings in May 2017, up 5 percent from the previous month but down 19 percent from a year ago, a 20 month consecutive decline. Nationwide one in every 1,636 housing units had a foreclosure filing in May 2017. States with the highest foreclosure rates were New Jersey (one in every 515); Delaware (one in every 753); Maryland (one in every 1,006); Illinois (one in every 1,057); and Oklahoma (one in every 1,081). Among 217 metropolitan statistical areas with a population of at least 200,000, those with the highest foreclosure rates in May were Atlantic City, New Jersey (one in every 271 housing units); Trenton, New Jersey (one in every housing 508); Fayetteville, North Carolina (one in every 523); Rockford, Illinois (one in every 690); and Philadelphia, Pennsylvania (one in every 722). A total of 35,787 U.S. properties started the foreclosure process in May, up 5 percent from the previous month but down 15 percent from a year ago and continuing an annual percent decline. Lenders completed foreclosure (REO) on 27,086 U.S. properties in May, up 4 percent from the previous month but down 20 percent from a year ago. Note: There is no report to go along with Attom Data Solutions’ May 2017 foreclosure activity.